Hyundai has jumped onto the 'cross style' of vehicles with the new i20 Active. The 'cross style' essentially are hatchbacks with beefed up bodywork and an elevated stance that makes them appear like SUVs while retaining their hatchback dimensions. The Hyundai i20 Active now joins the herd of the Cross Polo, Etios Cross and Fiat Avventura. We have driven the car and here is how its feels on the road. There are quite a few changes in the Hyundai i20 Active. Out goes the trapezoidal fog lamp design and in come rounded ones with cornering function. This is a steering wheel based function so when you turn right the right driving lamp lights up, similarly the left one lights up when you turn left (this is activated only when you switch on the headlamps). Hyundai have inverted the i20's grille on the Active with a chunky lower bumper protruding into the grille. There are LED daytime running lamps along with the projectors. 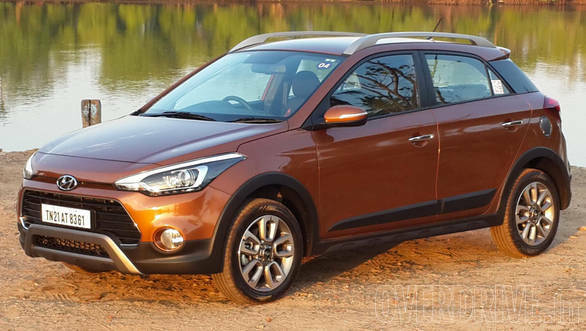 Hyundai has given the i20 Active new colour schemes (like the brown from the spy shots we posted earlier) to differentiate it from the Elite i20. The changes have been done up in a subtle manner and we feel that the i20 is one of the best 'cross' vehicles out there in the market. There are satin-finish roof rails, however we would have preferred them to be in body colour. The alloys have a new design too, but look largely similar to the ones on the Elite i20. The fuel lid is also done in a satin finish. Typical to its cross-styled rivals, the i20 Active too gets matte black cladding that underscores the bumpers and the side skirts. There are changes to the rear as well and these include the faux aluminium skid plate and round reflectors. While Elite i20's dashboard layout has been carried forward, the i20 Active gets a few more stylized items to spice up the interiors. 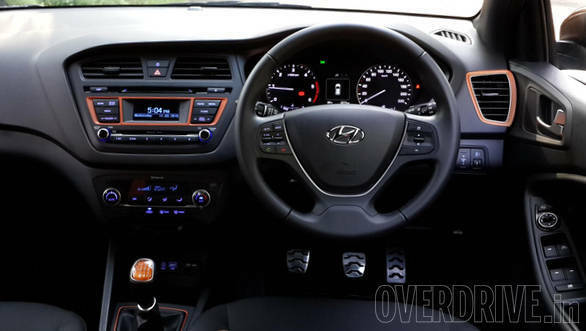 The Hyundai i20 Active gets dual tone black and orange upholstery, sports pedals, chilled glove box and a colour coded gear knob which we think is pretty cool. AC vents of the i20 Active have a brown bezel around them, however we found them casting a reflection on the ORVMs which can cause some distractions while driving. The Elite i20 was the most spacious car in its segment and the Active continues the trend. The boot space is also similar to the i20, which is 285 litres. While there were rumours of the i20 Active getting uprated power and torque, this doesn't seem to be the case. Hyundai, however, have tweaked the petrol and diesel engines for better torque delivery in the lower gears, six per cent for the former and as much as 11 per cent for the latter. This in turn has improved the low and mid-range performance of the car. The second generation U2 1.4 diesel engine makes 90PS and 220Nm while the 1.2 petrol makes 83PS and 114Nm, the former mated to a six-speed while the petrol comes mated to a five-speed manual. Claimed fuel efficiency for the petrol is 17.19kmpl and for the diesel is 21.19kmpl. With the engine getting a remap, the i20 Active diesel has become er... more Active in its throttle response. 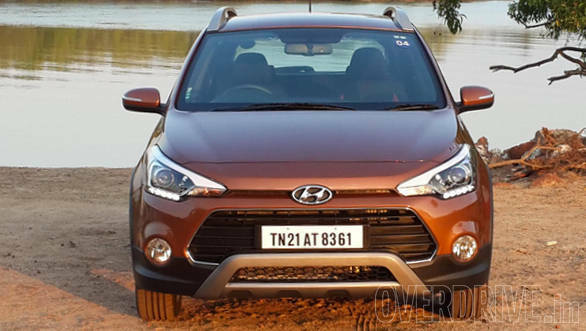 Hyundai claims a 6% improvement in performance, especially in the low and mid range torque for the petrol engined i20 Active. However 6% does not seem like much and only a full test will reveal just how much of a difference this makes to the overall performance. The 1.4-litre CRDi turbo diesel engine has improved by 11% and this is certainly more noticeable. The engine revs more freely and torque feels like it comes in earlier. Again a full test will reveal how effective the changes are. The turbo lag seems to have reduced compared to what is experienced in the Elite i20. This makes the i20 Active a sporty and fun car to drive, something which we don't usually mention in the same breath for a Hyundai. Even though the suspension has been raised, the increased ground clearance (190mm - 20mm more than the Elite i20) doesn't pose a problem in the corners with the i20 Active having less body roll than the other 'cross cars' in its segment. Steering feel is also the same as before, though we do wish Hyundai had made some changes by adding a bit more weight to the overall picture. The Hyundai i20 Active is hoisted on 195/55 R16 tyres and these provide a reasonably comfortable ride quality. Hyundai will be launching the car in India on March 17. It is expected to have a lower variant ratio compared to the Elite i20, most likely four including the petrol and diesel. The Hyundai i20 Active is expected to be priced nearly a lakh more than the corresponding Elite i20 trim.